Creating a wedding experience your guests will remember is all about catering to the senses. The tear-jerking ceremony, the lively music + atmosphere, and last but not least, the amazing food! It's the first meal you'll share together as husband and wife, not to mention all of your family and friends. 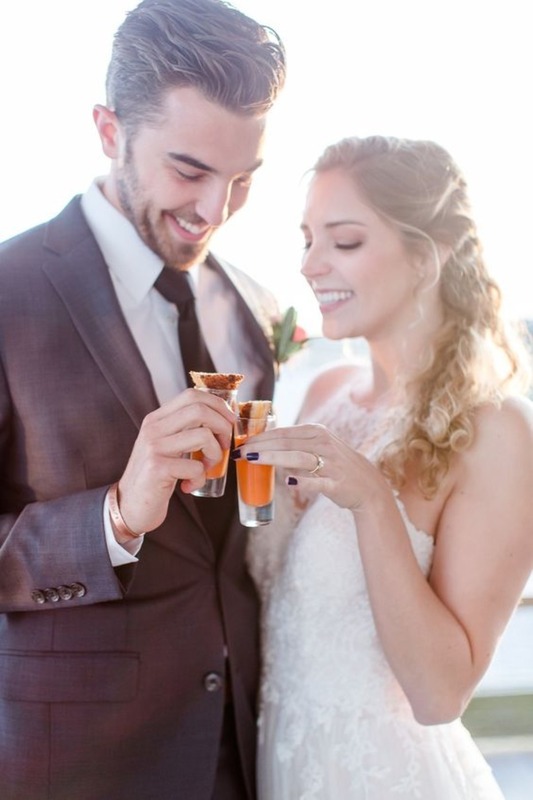 So for all you avid foodie couples out there, we have a few simple + tasty food ideas to get your party started. 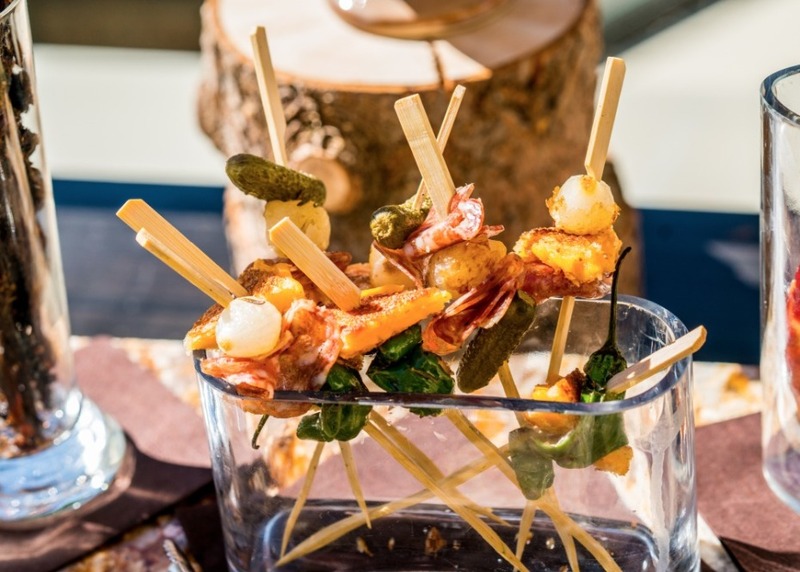 From simple hors d'oeuvres to late night snacks and everything in between, your guests will eat up these crave-worthy ideas! Just be sure they save room for dessert after. Uhm, yum! 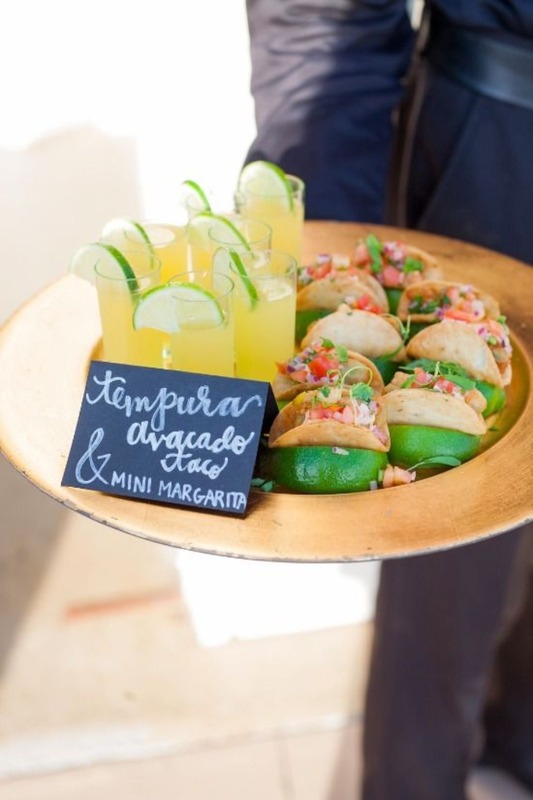 Who can say no to a mini taco and margarita? Common, this is a no-brainer. See the rest of this prety pink wedding now. 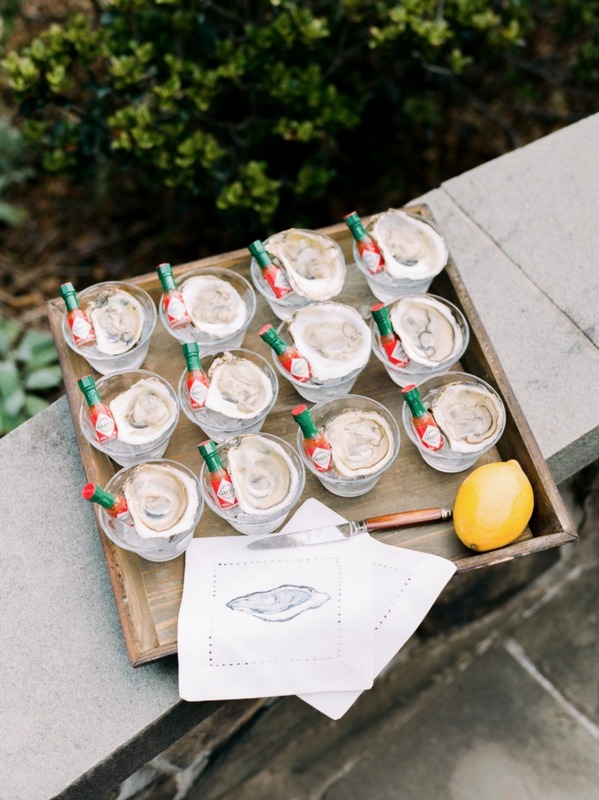 Your guests will be shell-shocked by these adorable and tasty oyster + tabasco shooters. Though these were featured at this stylish bridal shower, they would be perfect for a coastal wedding! 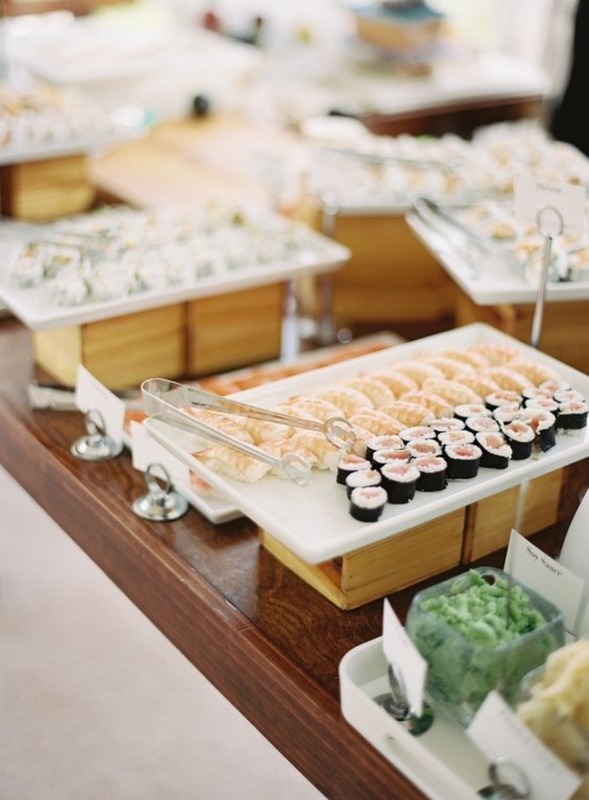 If you love sushi as much as I do, this would be a heavenly sight to behold at any wedding! 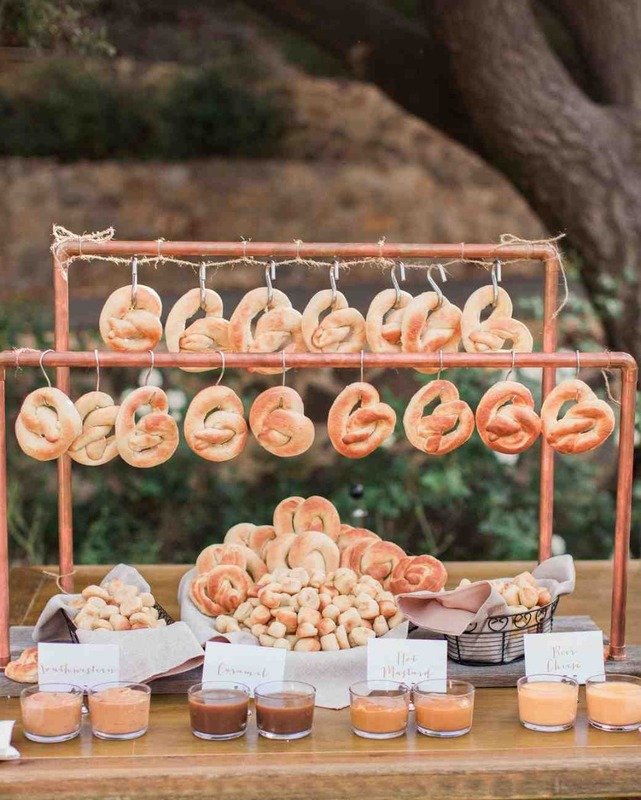 Speaking of wedding, see all the food served up at this chic backyard wedding now. 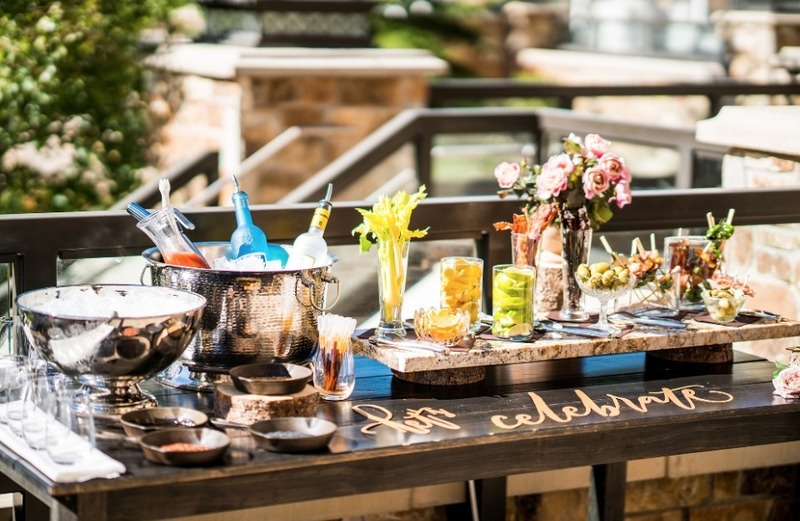 How about a DIY bloody margarita bar with all the fixins?! 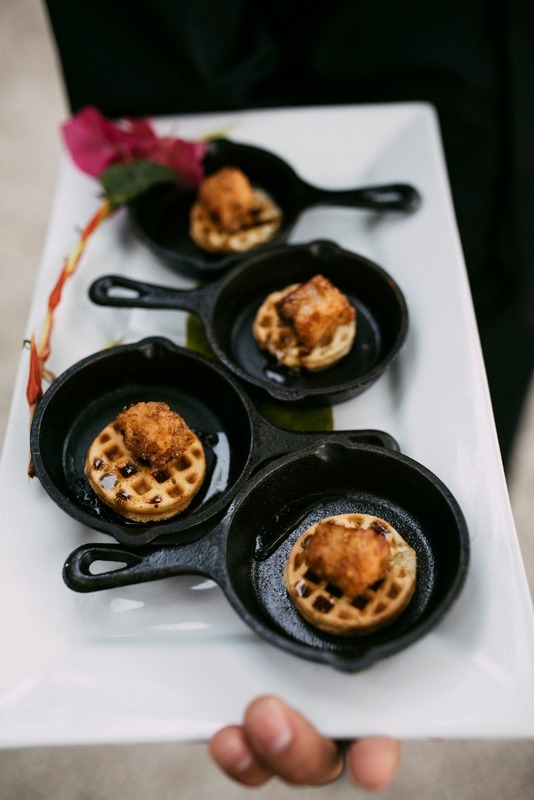 If you're having a brunch wedding, this is a must. Find more tasty brunch ideas here. 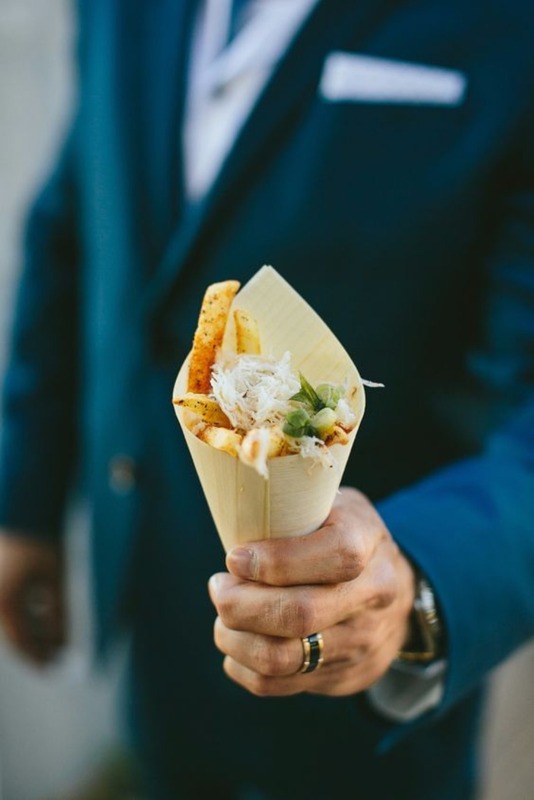 Treat your guests to something new, like paper cones full of crab fries! If this southern treat tastes as good as it looks, we're in! See the rest of this California wedding now. 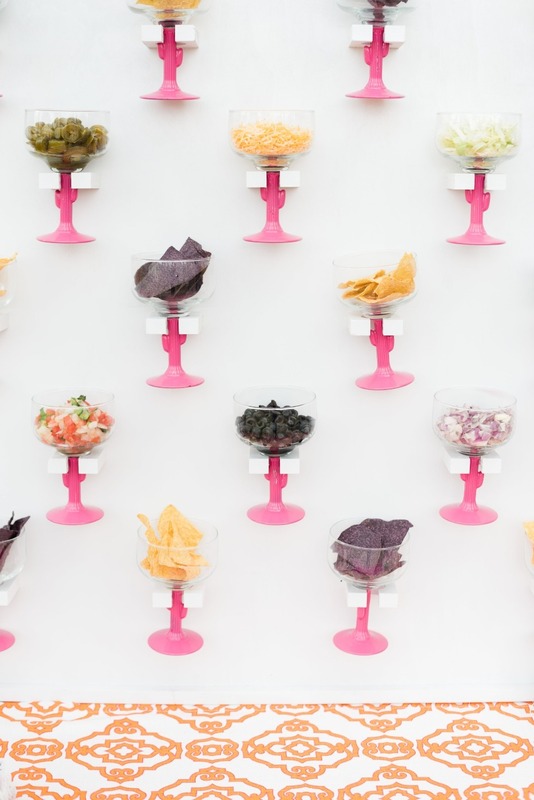 We love this build-your-own nacho bar with giant margarita glasses, and your guests will too! Find more fiesta wedding ideas here. Chicken and waffles! The ultimate southern comfort food served up in adorable mini skillets. Just wait till you see the rest of this stylish wedding. There are no limits here folks! 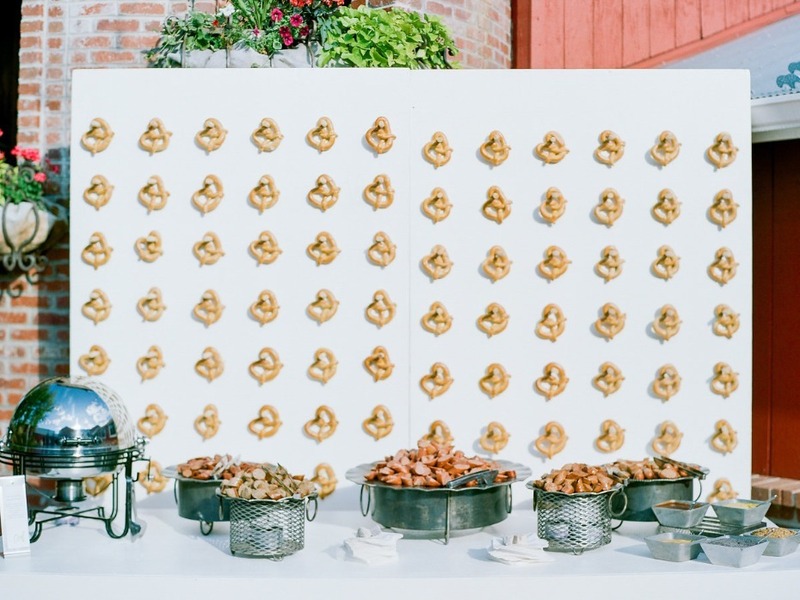 How about a pretzel wall with a tasty selection of sausages? Wait till you see the formal farm wedding that goes with it. And one more pretzel bar, because we decided we are hungry! 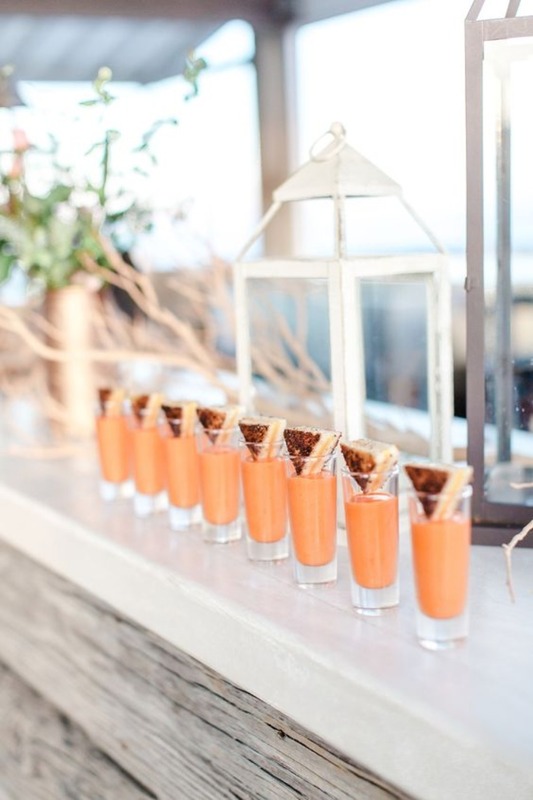 Tomato soup shooters with mini grilled cheese. Yes, please! Check out the rosé beach wedding that goes along with them. We're cocoNUTS for this next idea! 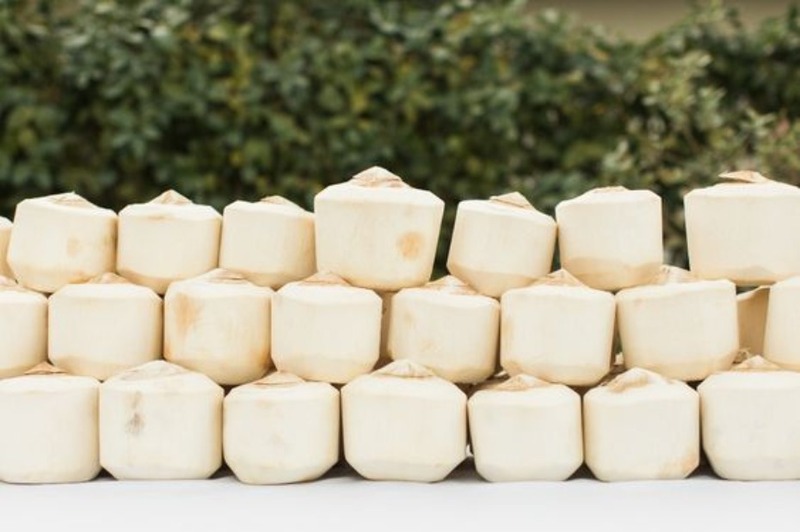 Serve up some fresh coconuts for a tropical wedding like this. Taco about a tasty looking hors d'oeuvre. You just can't go wrong with mini tacos! Especially at a poolside wedding like this. Fiesta like there's no tomorrow with these tasty chip and dip shooters. We're gonna need more chips! 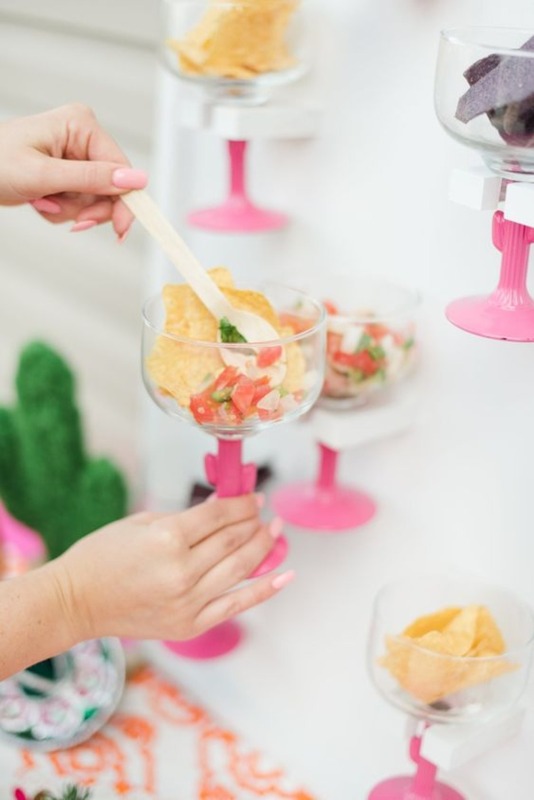 Find more fiesta inspired engagement party ideas here. How about some meatballs and marinara? This is super easy to throw together, and boy does it look good! 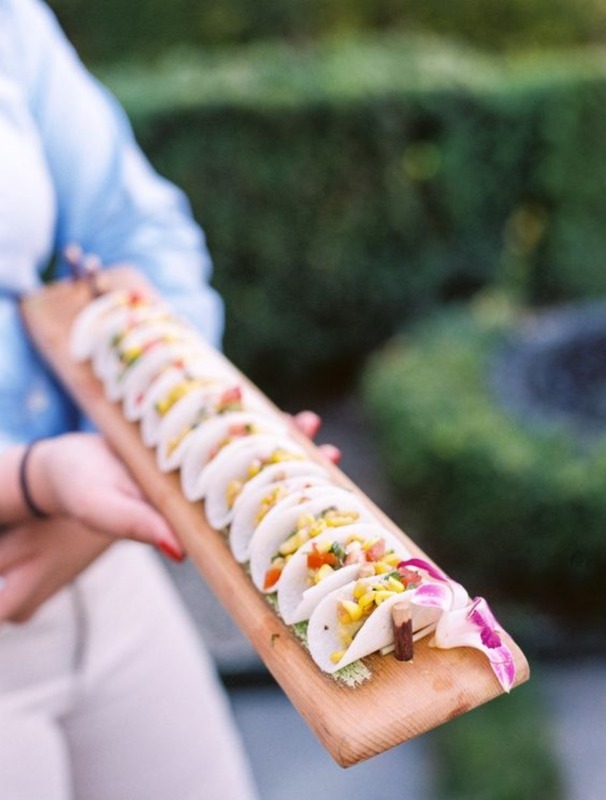 Check out the rest of the food at this misty California wedding. Get the party started with some burger + beer sliders! Check out all the tasty treats at this blue and white wedding. A surgary late night snack your guests can take home is probably the best idea ever! If you haven't checked out this formal farm wedding yet, now you can! 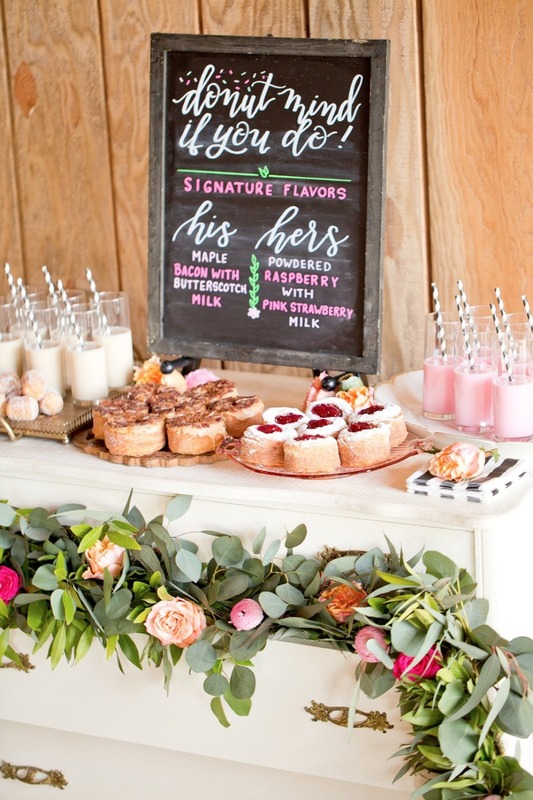 If you're having a brunch wedding, may we suggest a cute waffle bar with all the toppings? 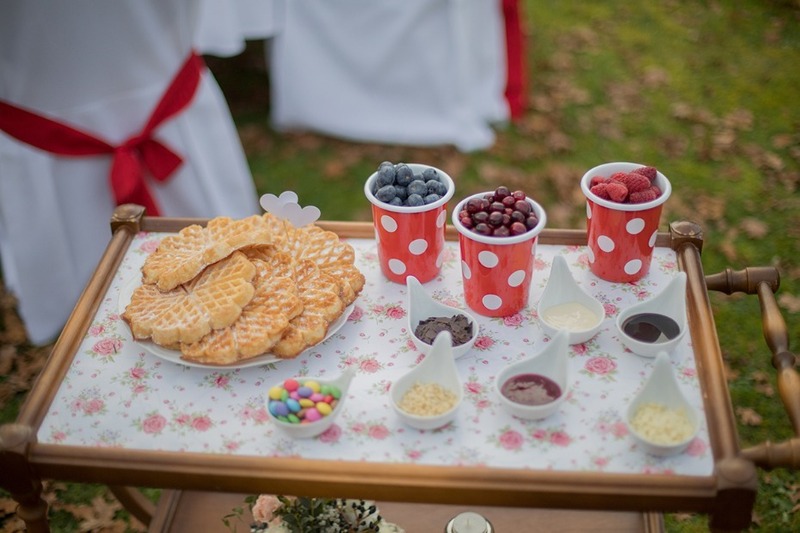 Learn how to make this waffle bar here. 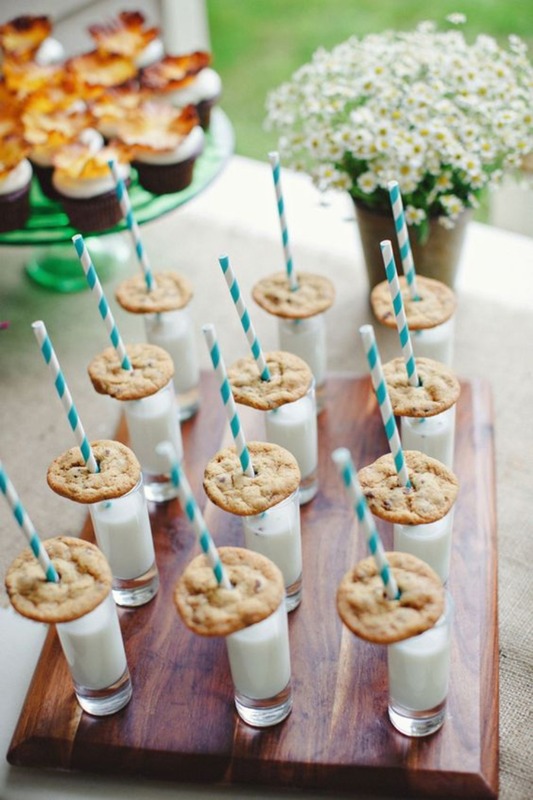 Cookies and milk are the perfect dessert for the kids and a fun treat for the adults. This is really a win-win for everyone. Find more fabulous ideas for a wedding or shower here. 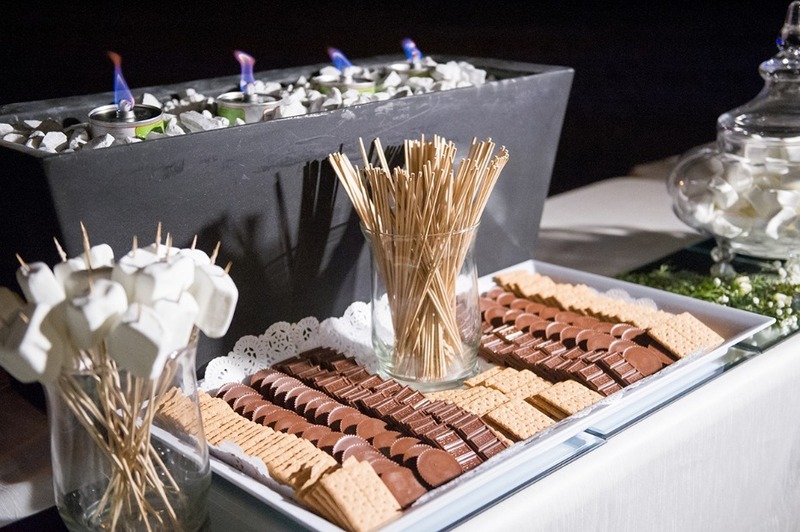 Show s'more love with a fun s'mores bar like this! Check out the amazing buffet at this wedding. 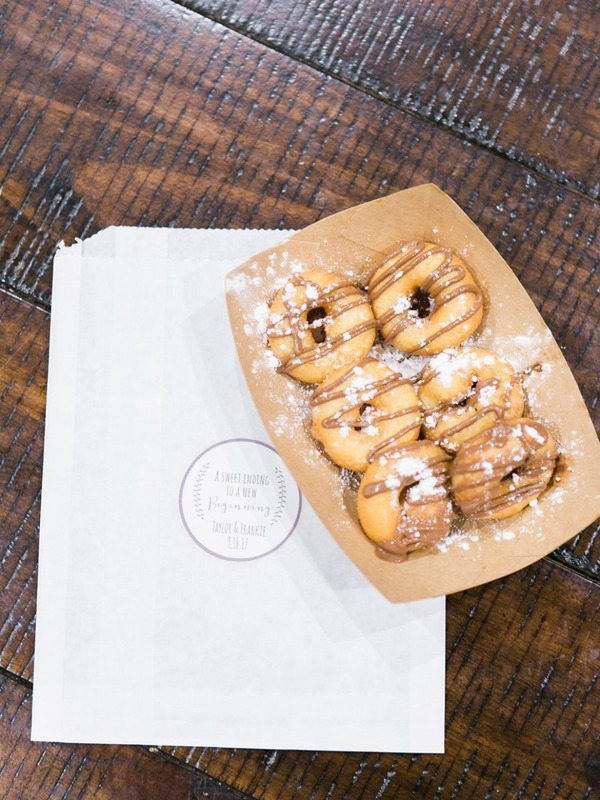 We're dying over this 'his and hers' donut + milk bar! Choose your faves and make this happen now! Check out this Kate Spade inspired wedding now. Who doesn't LOVE pizza? 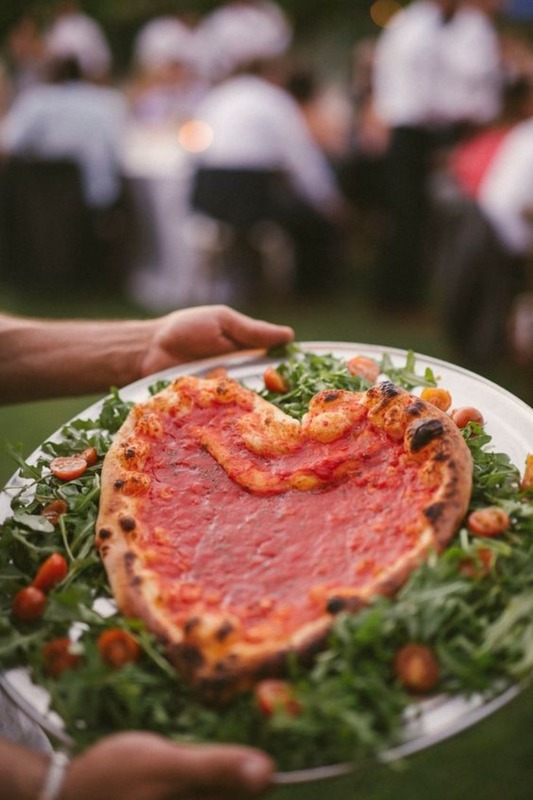 There is no shame in having a pizza bar at your wedding! 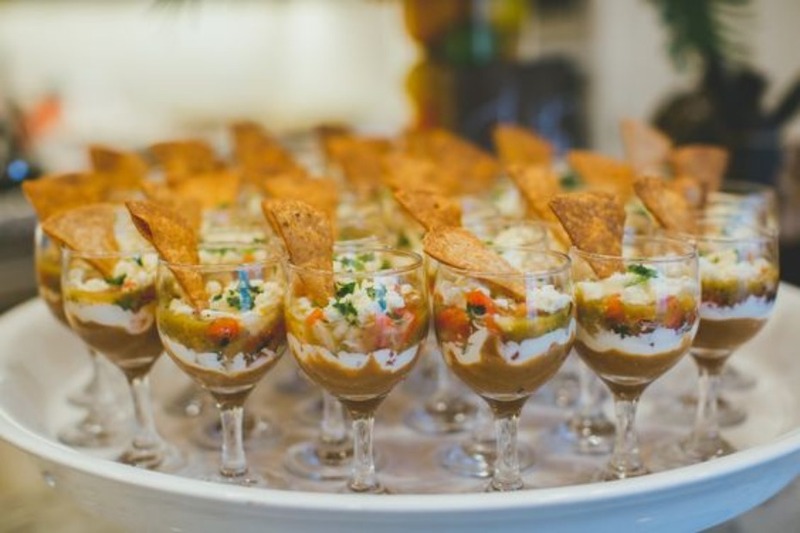 Served by the slice, or custom made personal pies, there are plenty of great catering options your guests will love. Check out the rest couples garden party wedding now. 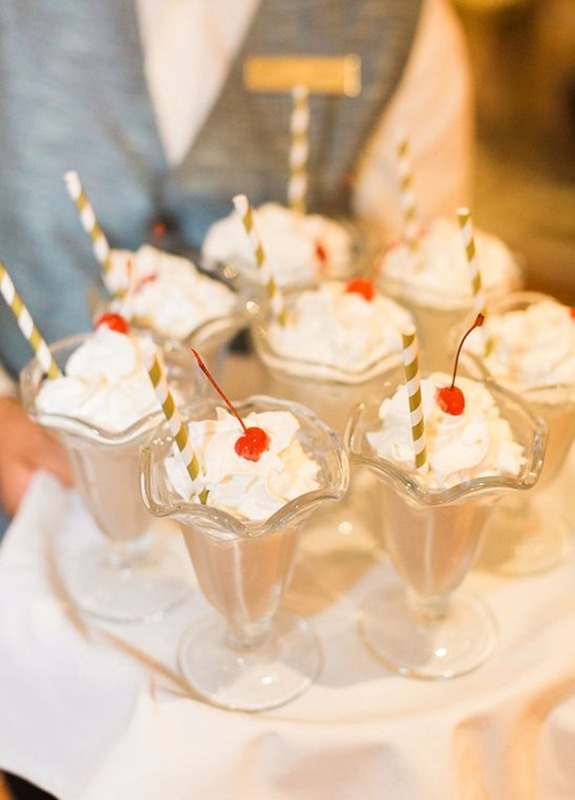 Shake up your dessert selection with tasty milkshakes for all. 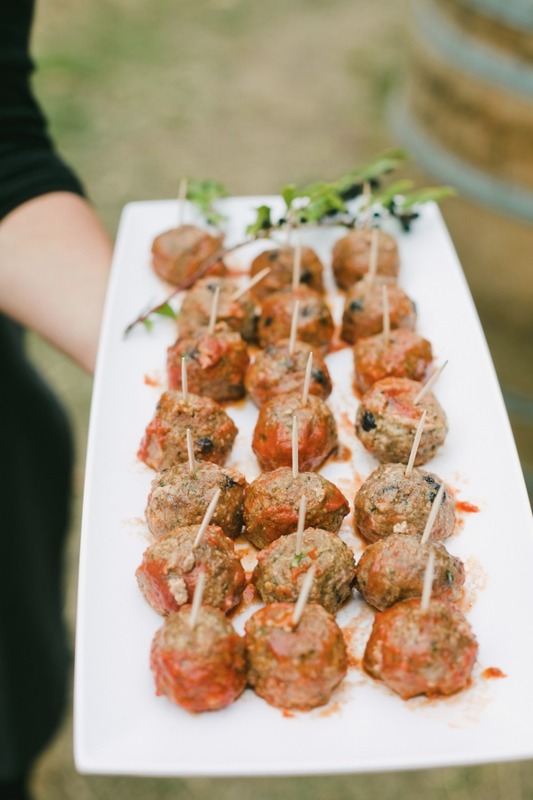 This is the perfect late night treat for a summer wedding like this one. 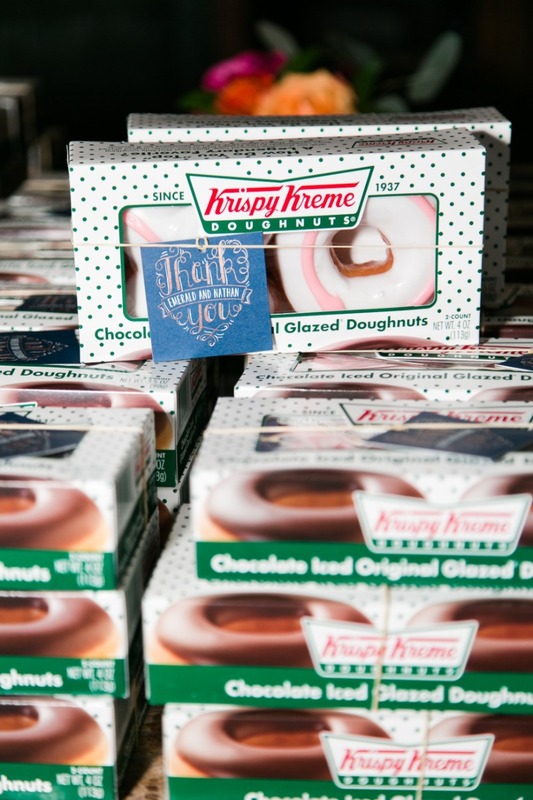 Your guests will LOVE and appreciate the additional surge of energy these donut wedding favors will give them. Put them out toward the end of the reception, and make sure to save yourself a box or two. See the rest of this rose gold and pink wedding.